After coming home from a great vacation in DC- lets just forget aboutHot Chocolate 15k Race Recap the horribly executed 15k I ran down there. We signed up for a indoor bike time trail at the Trek store in Portsmouth. My coach runs it so I kinda had to go. I also went to pick up my new bike... SHE IS GORGEOUS but that is another post for another time. So the indoor TT sires works like this- you get on your bike warm up and then the group goes all out for 20 min. Hard as you can to get the best power reading. Power meaning working the hardest for the 20min not going the longest distance or getting there fastest. It is an interesting concept. I actually was in my hardest gear with another 5 min to go and after we got off learned I could have changed the trainer to get higher power... oh well. Next time. On Saturday I told J I would run a SANTA 5K with her. 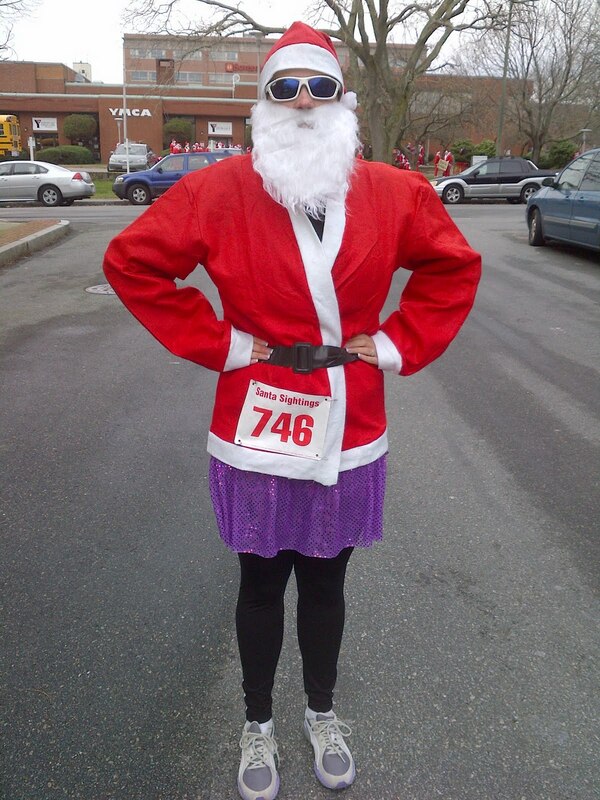 The whole premise being you sign up get a Santa suit and everyone runs the 5k in a Santa suit. Okay I'm down this is a total fun run. Who can run fast in a Santa suit?! I went with Santa hat, jacket, and stuck to my trusty team sparkle skirt. I am really enjoying wearing that. J and her friend Laura and I ran a fun race. We ran and sang Christmas Carols. Sunday was the Winter Classic. The course is pretty flat. Last year I ran to pace a friend and this year I wanted to see what I had. I did a little warm up since coach wanted me to- usually I just toe to the line and go. It was FREEZING as it always is for this race so the warm up felt good. As I stood waiting for the start I had that I might be getting a cold feeling- which I was and now currently have!- and I thought I'm not sure how this is gonna go I did a 15k, a time trial, and a 5k yesterday. Its been quite a week. I set my watch for a 8:40 pace and hoped maybe I could hold on to PR but didn't have much expectation. Mile 1 was a 8:55, Mile 2 was a 9:02- my legs started to really feel all the racing. I decided might as well bear down and see what I can get out of this. I also started to pick off each person in a costume that was in front of me. Christmas Fairy- down, gift bag girl- down, santa suit girl- down. Mile 3 was a 8:48 pace. I didn't hit the 8:40 pace I was looking for originally but I did end up with a PR of 27:33. 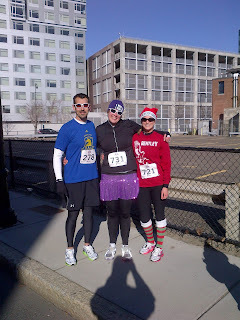 The pace was 8:53- this was my first sub 9 min pace 5k! The look of shock on D's face as I came close to the finish w 27 min up on the clock was great. I'll take a 30second PR especially after all I did all week! 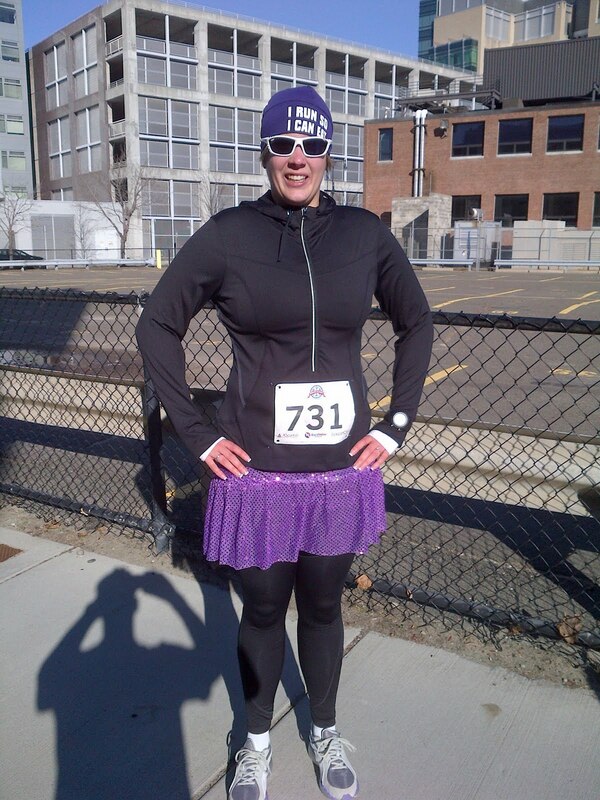 The power of the team sparkle skirt wins again! So for the count that is 1 bling 5k with a course PR, a 10k PR, a new 15k PR (first ever 15k), a santa run, and a shiny new 5k PR! That purple skirt is makin for a ROCKIN WINTER season! We had a fun Sunday D had a course PR by a min and half, almost had a PR and had a great run. My friend Danielle got a nice shiny new PR out of the race too. We all went and had a great brunch and stuffed ourselves to capacity. great PR Julia!! And what an awesome morning/afternoon! !